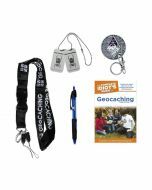 This is the perfect kit to start a geocaching program at your school, camp or club. It comes complete with all the essential materials you need to get started. Please keep in mind you will also need GPS enabled devices which are not included as part of this package.